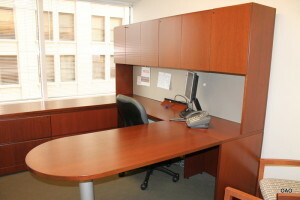 Small and medium-sized companies can benefit a great deal from buying used office furniture. If you’re considering used furniture for your office, here are some things to keep in mind when choosing desks for your employees. The size of a desk is very important, since it must be big enough to provide adequate workspace, yet still be proportional in size to your room. If you only need space for a laptop, a simple writing desk might suffice, but one with deep drawers and a hutch would be better suited for a desktop computer, printer and office supplies. The size of a desk can also affect ergonomics. For maximum comfort, choose a desk that’s between 26 and 30 inches tall, and no deeper than 32 inches. The materials a desk is made from will not only affect its durability, but the way it looks as well. For a more elegant look, choose a desk made from mahogany, cherry, or oak, as these woods are both attractive and durable. Avoid buying desks made from engineered wood, as they tend to warp easily, and may not stand up to extended wear. Inspect drawers and doors to make sure they open and close easily. Check all hardware to see that it is solid and does not contain any rust. Look inside drawers to see how edges are held together. Dovetail joints are preferred over glued or nailed ones. Some signs of wear are acceptable, as long as they do not detract from the stability of the piece. A top-quality used desk will provide you with years of practical use at a fraction of the cost of a new one. Fortunately, there are also plenty of choices available that will allow you to outfit your office in style. Contact us today to see the selection we have available.